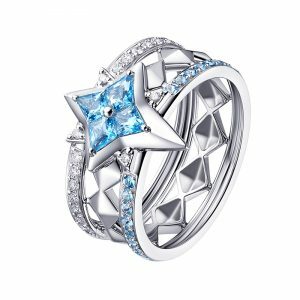 View basket “Whispering Medium Briolette Pendant with Green Amethyst” has been added to your basket. Pig necklace and bracelet set with 7.3mm chalcedony in 14ct yellow gold. This jewellery set comes packaged with 16” + 2” extension 14ct yellow gold chain and a 16” red cord. Magnolia small pendant with a 14mm x 8.5mm and 9mm x 5.5mm cat’s eye stones and cubic zirconia, set in white rhodium plate on sterling silver. 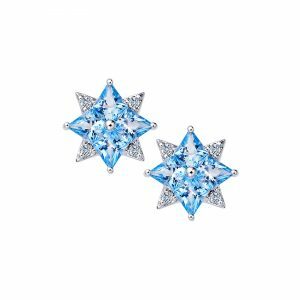 Magnolia adjustable drop earrings with two 9mm x 5.5mm cat’s eye stones and cubic zirconia, set in white rhodium plate on sterling silver. 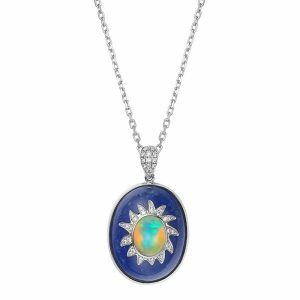 15.81ct oval lapis lazuli pendant with 0.71ct diamonds and 0.61ct opal, set in 18ct white gold. 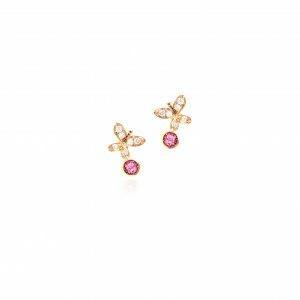 Drop Earrings with 3.06ct red garnet, 0.285ct white diamonds and baroque pearl, set in 18ct white gold. Pendant/brooch convertible with 42.5ct baroque pearl, 0.92ct blue sapphire and 0.5ct white diamonds, set in 18ct white gold. 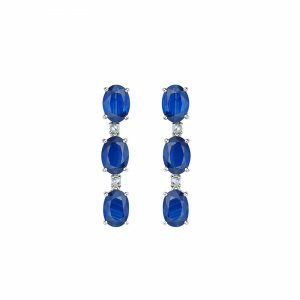 Drop earrings with 5.23ct blue sapphire and 0.068ct white diamonds, set in 18ct white gold. 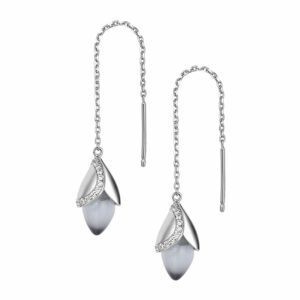 Pearl earrings which suspends from 2.01ct blue sapphire and 0.053ct white diamonds, set in 18ct white gold. 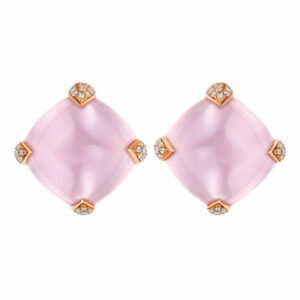 Rose quartz cabochon stud earrings with diamond-set claws, set in 18ct yellow gold. 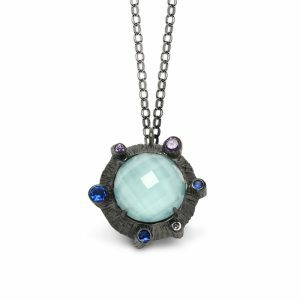 Dawn small pendant with turquoise, blue cat’s eye and purple cubic zirconia. Set in hammer textured black rhodium on 18ct white gold. 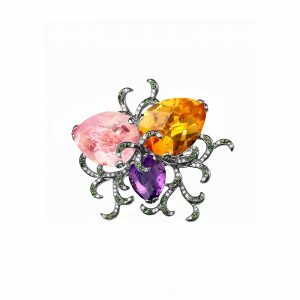 Whispering tri stone ring featuring three pear cut stones of 16ct citrine, 15ct rose quartz and 4.3ct purple amethyst, with stone set curl details of 0.22ct diamonds and 0.4ct green garnets. 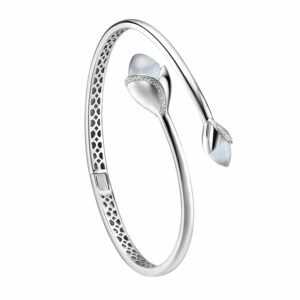 Set in high polish black rhodium plate on 18ct white gold. 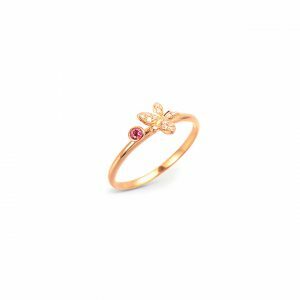 Buddleia ring with pink tourmaline and white diamonds, set in 18ct rose gold. 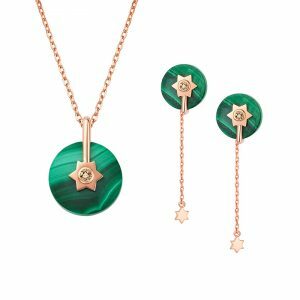 Stella pendant and earrings set, with malachite and champagne diamonds. Set in 14ct rose gold. Get an extra 10% off when you enter XMAS10 during checkout!